Jesus was a pretty funny fellow! Yet, Jesus had a witty sense of humor and such a striking and wonderful way with words that, when I read through the bible, sometimes I can’t help but smile. And then I wonder if the people that followed Jesus smiled as well as He spoke to him. 41Why do you notice the splinter in your brother’s eye, but do not perceive the wooden beam in your own? 42How can you say to your brother, ‘Brother, let me remove that splinter in your eye,’ when you do not even notice the wooden beam in your own eye? You hypocrite! Remove the wooden beam from your eye first; then you will see clearly to remove the splinter in your brother’s eye. When we read this passage, we often do so very seriously, because this is a very serious passage that reminds us that we have our own sins that we need to deal with… especially when we’re trying to counsel others. Otherwise, we are hypocrites. And that is an incredibly serious thing to consider as we examine our lives and judge for ourselves how well we are truly walking with God. And yet, what a whimsical image Jesus uses to illustrate His point! 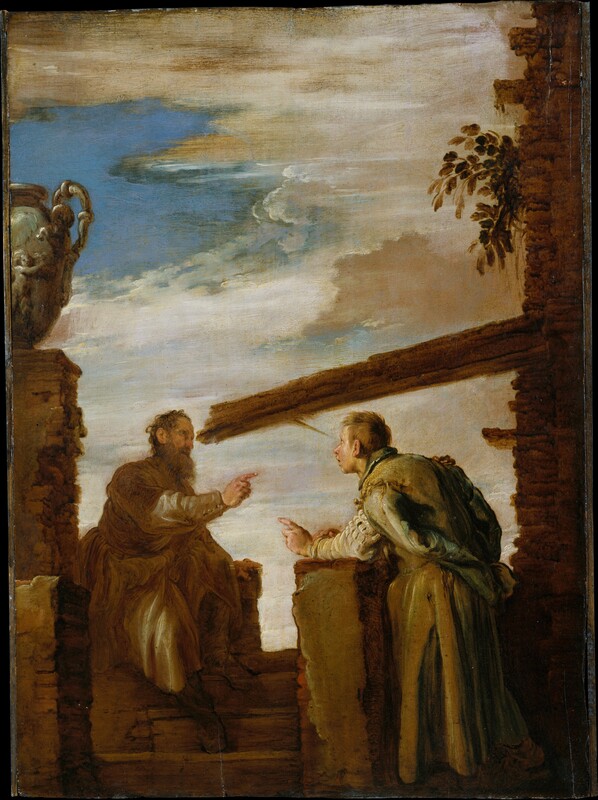 The Parable of the Mote and the Beam, by Domenico Fetti, c. 1619. Metropolitan Museum of Art, New York New York, United States. These artworks were designed to look like a normal scene in the life of a seventeenth century Italian… with a twist! And so, in this artwork, two men talk with each other. On the left side, there is an older man who might possibly even be blind, since his eyes seem clouded over. To the right, a younger man looks at him with his mouth open in protest. They are each pointing fingers at each other and it looks very likely that they are arguing with each other. Were it not for the twist, it would look like a picture of a wise old man lecturing a foolish young man, who refuses to take his advice. But lo! The wise old man has a huge beam coming from his eye, whereas the young man only has a tiny splinter! In fact, it’s very likely that the old man is blinded by this huge beam in his eye, while the young man still has clear eyes. And so it is definitely a funny image! After all, humor often takes our perceptions and turns them upside down, which is why odd things can seem so funny! Yet, this artwork definitely illustrates that hypocrisy is definitely a dangerous thing. After all, we can be so blinded by our own distorted perceptions of ourselves that we may not even realize the depth of our own hypocrisy.